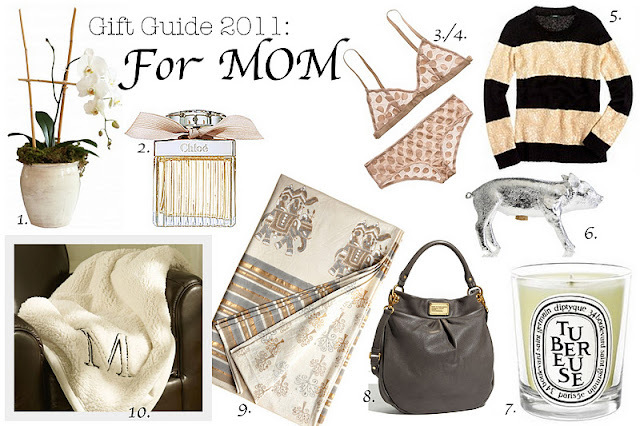 The next Gift guide was pulled together with Mom in mind. I love to give my Mom, and all Mom's on my list - gifts that they may not normally get for themselves. Little luxuries they truly deserve - well really they deserve the whole list!!!! It's all about simple, chic luxuries!!! 1. Orchid - give her something that will last long after the Holiday's, a treat she will remember you by long after you have returned back home! 2. Perfume - Give her a fancy new perfume, maybe your personal favorite!! She'll be sure to love! 3 & 4. Lingerie - I love treating my mom to fancy under pinnings - she'll buy them for me in a minute but saves on herself, its a little something I love to do to spoil her! 5. Sparkly Sweater - Thrown on over skinny jeans & pair with chic ballet flat, give her a sweater that will make her feel & look like a million bucks. 8. Handbag - Add something she wouldn't normally pick for herself to her collection - I know this one is on my Mom's list! 9. Luxurious Tablecloth - Every dinner party will feel extra special with this fun new addition! 10. Cozy Soft Throw - Get her a cozy embroidered throw - every time she cuddles up on her bed or couch she'll love it! What are you getting for your Mom or the Mom's on your list??? I am a mom...I love all of these! I love that striped sweater -- so pretty. I got lots of goodies are Sephora for my mom, she loves all Philosophy line so she got a good supply of products this Christmas. Such a pretty collection! I love the piggy bank and gorgeous tablecloth. Great suggestions! My mom would definitely love that bag! Shop women's shoes Chicago for your mom this holiday season! Visit CITY SOLES in Wicker Park and online for European designer shoes and boots! I got my mom a pair of tory burches! love this!! wait. does this mean i have mom style or our moms just getting that much more stylish?? Ooooh - great guide! I would feel weird buying the undies for my mom, but I did order them for myself! The sparkly sweater is a lovely gift. I also think that the candle is a great idea - Diptyque are the queen of candle makers, their scents are divine.